The Apart PUBSET is the ultimate set solution for creating an enthusiastic ambiance for dance floor applications in caf�s, bars or trendy shops. 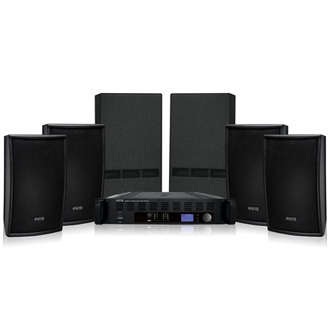 This set consists of 4 MASK8 loudspeakers, 2 SUB2400 subwoofers and 1 CHAMP-3D amplifier. The PUBSET is powered by the 3-channel digital CHAMP-3D amplifier which has a built-in high-class DSP processor and because of his convection cooling it is insensitive to dust and above all maintenance free. The amplifier can operate in 3 modes: fully locked, volume only or with all DSP functions fully accessible. Further features of the CHAMP-3D are the extensive limiter, delay, full parametric 4-band equalizer, compressor and subsonic filter. The unequalled MASK8 top loudspeakers bring crystal clear high and mid tones. The powerful kick basses that you will feel come from the SUB2400 subwoofers. This PUBSET will bring people in a dancing mood!